When people sign up for the email list, they automatically get an email from me asking them to reply with their trip planning concerns. The number 1 thing that people email me is that they feel overwhelmed (number 2 thing is that they just want their kids to have fun). I am interested in knowing if you can help us with planning an itinerary for our trip. I have read a lot of information but find it all overwhelming and would like a loose schedule that includes all the important items and not something planned by the minute. There's that word again - overwhelmed! Luckily, the person who replied to me pointed me in the right direction and I've never turned back. And I want this site to do that for you. My hope in creating this site was to simplify the process so that it wasn't so overwhelming. That's why the 6 steps are in the planning process, and that's why I created this infographic. The problem is that you all know there are a LOT of topics that go outside those 6 steps and it feels never ending. Guess what? It is. I read about Disney World every day and have for many years and I still learn new things daily. There are ways to help the trip planning process feel less overwhelming. Here are 4 tips that I think should help. 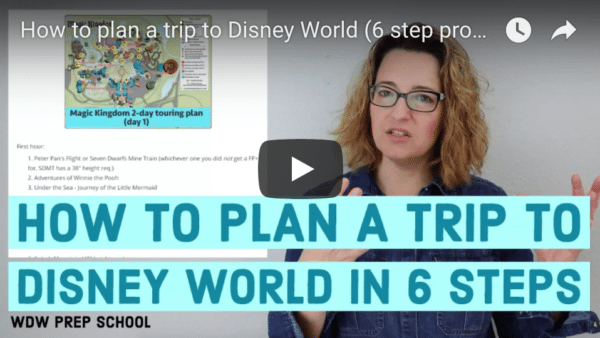 The fact that you are here and reading and maybe even did follow the 6 step planning process means that you are already ahead of most people visiting Disney World. Only a small fraction of visitors really take the time to plan. You already know enough to have an enjoyable trip. We go to Disney World a lot and still haven't done everything. Each trip, I make a list of new things I want to do and see if I can fit them in. Even if you're only planning to go to Disney World once, you should know that you still won't do everything. The point should be to have fun, not do it all. Pick and choose what you want to do and have fun doing it. If you follow my suggested touring plans, you'll hit the best attractions at Disney World (but not all of the attractions). This should help you narrow down your choices so you know what to try to do. As I mentioned, I've spent years reading daily and still learn new things constantly. The questions that you all send me often require me to research so I learn things in that process... and there's still so much I don't know. No matter how much you read, you'll never get to some kind of final destination where you know all there is to know. Just learn what you need to learn and try not to get into a level of detail that is more than necessary. Disney-specialized travel agents can help you alleviate a lot of anxiety since they can make so many of your plans, including dining reservations. There's a handpicked teams of agents for WDW Prep readers and if you fill out the Get a Quote form, the info will go straight to them. If you're a person who likes doing it all yourself (like me), you'll have to do more work so just be prepared to read and research and so you can make good decisions (although the likelihood of feeling overwhelmed will increase, at least initially).